Our personalised rose gold necklace gives everything you wear a touch of romance, after all, any piece becomes even prettier when in the rosy pink shade. Rose gold jewellery has made some notable appearances throughout history, first introduced during the nineteenth century in Russia. At the time it was commonly referred to as ‘Russian gold’ due to its popularity and fashion appeal amongst Russians. Rose gold jewellery was seen again during the mid-victorian era when everyone wanted pink-hued jewellery. Pink is the colour of romance, and so a rosy blush to jewellery was the style of choice during this period. The most recognised period of rose gold’s popularity was in the late 1920s, when renowned French jeweller, Cartier released a signature piece of jewellery called the Trinity Band, bringing Rose Gold to worldwide fame. The Cartier Trinity Ring was made up of three entwined smaller bands, one rose, one white and one yellow gold band linked together. Jewellery designers saw a high demand for the desire for rose gold. Why did Rose Gold begin to fade into the background? During war periods, the government banned the use of platinum amongst civilians – it was solely for military purposes. So once again rose gold’s distinctive reputation soared and became the standard alternative for jewellery pieces. It also continued to flourish during the ‘Retro Era’ between 1935 up until the 1950s, when yellow gold and rose gold was a popular trend at the time. However, during the 90s, minimalism was in and was stylised by black and white. The fashion industry wanted modern styles, and so silver and white gold jewellery trends rose once again due to their crisp appearance and contemporary edge. Rose Gold jewellery faded into the background and became an antique option of the past. While some people may still be going for the gold and silver pieces, it is rose gold jewellery that has been making news this season. The rose gold trend has given watches and jewellery a fresh alternative to traditional yellow gold and silver, with the hue now taking over almost every style category, from housewares to clothing. On the Spring 2017 runways, we saw every iteration of pink, with gorgeous shades of rose gold, starred in collections from the likes of Valentino, Noon by Noor and Monique L’Huillier. The runways and new trends have proved that rose gold works for day, for party season and everything in between. What makes Rose Gold pink? If you didn’t know the story behind the creation of rose gold before, then you’re not alone. Rose gold is a mix of traditional yellow gold, alloyed with copper. The shades of rose gold vary, depending on the ratio of yellow gold to copper. The more copper applied, the deeper the colour of the rose gold. Conversely, you have a much softer shade of rose gold when there is less copper. The various intensity of the rose gold tones means that rose gold can sometimes be called red gold or pink gold. Since the copper portion of rose gold can begin to darken over time, rose gold can change its colour and gives an impression of a vintage or antique piece. The subtle changes in the tone of rose gold jewellery make it one of the most coveted types of all gold jewellery. Chemistry aside, what we do know about the pink-hued precious metal is that it is simply beautiful and becoming ever so popular. Most people either identify themselves as a ‘gold person’ or a ‘silver person’ choosing one of the metals as the best colour for their skin tone and personal jewellery style choice. However, the warm rose gold tends to look great on everyone, complimenting all skin tones. Could it be the most universally flattering metal ever? We certainly think so. Worried about going off the track by choosing rose gold rather than the classic sterling silver or yellow gold? Don’t. Beyond skin tone, rose gold looks great when worn with other metal hues, so there is no need to ditch ‘Team Gold’ or ‘Team Silver’ when rocking your new personalised rose gold necklace. If you’re looking to get your jewellery game right on trend, why not layer a few dainty pieces of different metal hues together to change up your style. Featured by the queen of all things green and ethical, the Woodland Wife has listed our Rose Gold Birthstone Initial Necklace under her favourite things and ‘get the look’ feature in the Little London Magazine. We are super chuffed to see that both the Woodland Wife and the Little London Magazine has noted our brand and how we too make environmentally conscious decisions with our jewellery making to help contribute to the ethical fashion movement. Not only are these celebrities a fan of this rose gold jewellery trend but you should be too. 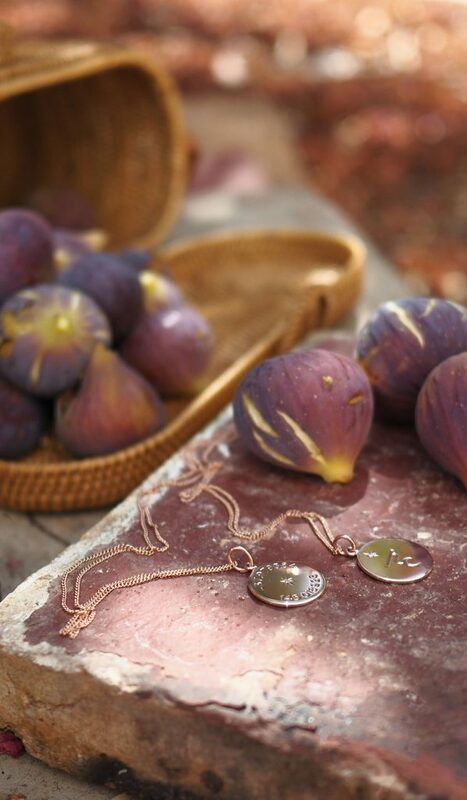 The warm colour is flattering to the skin tone, especially when you have a glowing summers tan, why not add a personalised rose gold necklace to your jewellery collection just in time for the summer. The rose gold tone blends well with many gem colours so you can create a perfect look by embellishing the rose gold necklace with a birthstone personal to you. Rose gold has a unique, vintage quality resembling the notion of exclusivity, make that someone feel extra special with a personalised rose gold necklace. Our rose gold necklace can be personalised in various ways including hand engraving inspired by our Initial Collection. 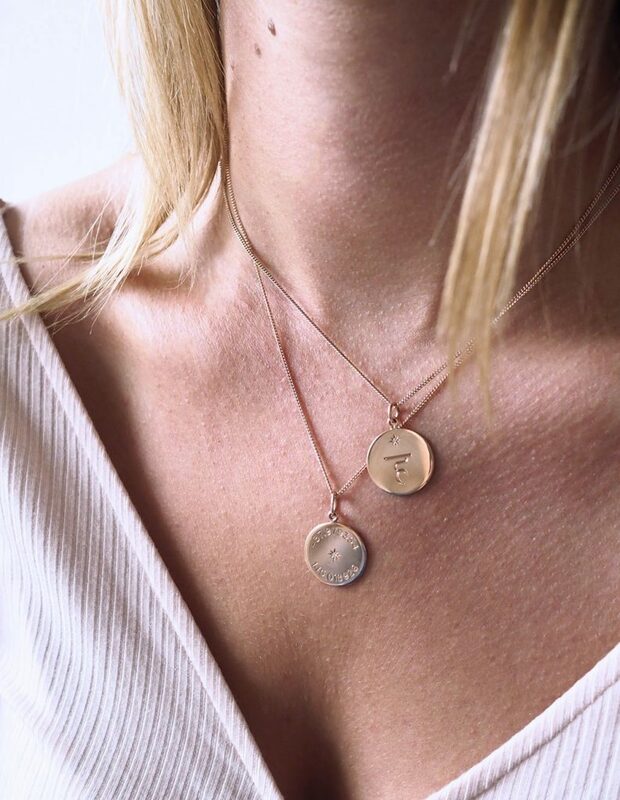 You could keep your personalised rose gold necklace classic and elegant by choosing a single initial to be hand engraved on the disc, in a scrolled traditional style. Maybe your initial, or the recipients or a letter that carries significant meaning to the wearer of the personalised rose gold necklace. Feeling torn over what initial to choose? We have just the answer to this woe, with our new Double Initial Necklace and Triple Initial Necklace new to our collection, giving you more freedom of choice with what initials to be hand engraved. Perhaps the initials of the wearers’ full name? Or yours and her initial entwined together on a single disc, perfect for you and your best friend or a marriage gift. The single, double or triple initial engraving allows for the personalised rose gold necklace to make the ideal gift for a new mother, to carry the initial of each of her children around her neck always. Add an extra sparkle to this personalised rose gold necklace with a sparkly birthstone. The birthstone could be the wearers, or simply her favourite gemstone, or one that carries symbolic meaning and values that you want to encompass on the personalised necklace. Read more about the different legends and meaning behind the precious gemstones on our blog page, from January’s garnet right through to December’s blue topaz. Alternatively, a new option we are now offering is the option to personalise the back of the disc. We suggest an important date that you want to commemorate permanently by being hand engraved on the back of your personalised rose gold necklace. Perhaps a birth date, wedding date, the date you first met, graduation date, or a time that carries significant meaning for you or the wearer. 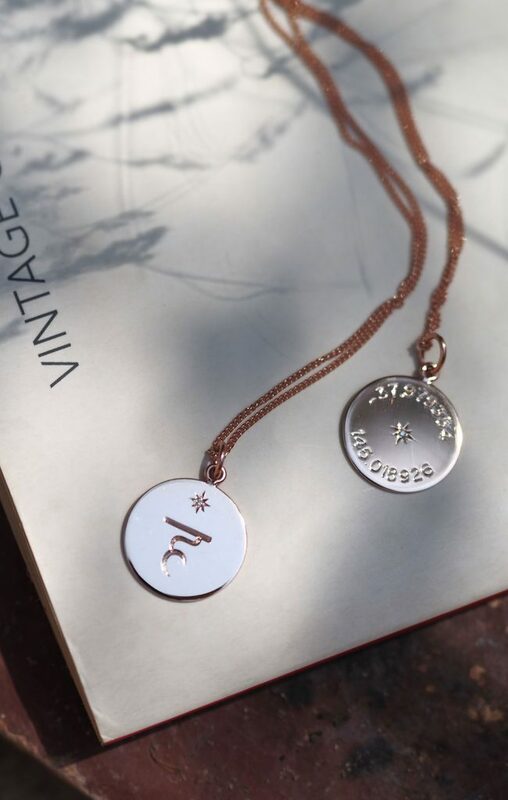 For those wanting to sway off the classic Initial Necklace, a unique way to create your personalised rose gold necklace is to have latitude and longitude coordinate hand engraved onto a disc to mark out a location meaningful to your or the wearer. A perfect gift for the jet-setter seeking adventures and travelling the world, either choose to have their favourite destination from their travels engraved or perhaps make sure they take a reminder of friends and family with them by having the coordinates of their home hand engraved. The latitude and longitude coordinates that you choose to engrave on your personalised rose gold necklace could represent the location you first met, your wedding venue, your first house with your best friends, or your favourite location that you spend time in or with the recipient of this treasured piece. A unique way to secretly personalise your jewellery so that only you and the wearer know the meaning behind the piece unless asked of course! A meaningful way to personalise your gift without being overly cringey or gushy. If you have further special requests regarding the hand engraving on your personalised rose gold necklace, do not hesitate to contact us and we will do our very best to help create your ideal personalised piece of jewellery. Personalised Rose Gold Necklace is a touch of understated elegance and feminine style. Treat those who deserve it most.